Top-of-the-line in every respect, Teac’s V-8000S cassette deck combines a solidly engineered tape transport with a complete range of performance and convenience features. In addition to Dolby B and Dolby C, the V-8000S includes the newer and sonically superior Dolby S noise-reduction system. Calibrated user-selectable bias and sensitivity adjustments enable accurate performance optimization for virtually any tape formulation, and Dolby HX Pro circuitry extends the deck’s treble response with high-level signals. For convenience, the tape counter reads directly in minutes and seconds, and a fifteen-selection search facility enables rapid location of any selection on the tape. And the wireless remote control even includes a button for turning the display-panel lighting on and off. In designing the V-8000S, Teac’s engineers paid particular attention to preventing mechanical vibrations, which can degrade the sound by producing either wow-and-flutter or modulation noise. Heavy steel chassis sub- assemblies provide not only electrical shielding but an unusually rigid interior structure as well. The transport mechanism is attached to a vibration- deadening structure of its own, and a spring-loaded cassette stabilizer and three-point mounting system prevent shell vibrations from being transmit ted to the tape. Even the top cover is secured with five additional screws to prevent any possibility of resonant rattling. The dual-capstan tape transport uses a direct-drive, phase-locked-loop (PLL) DC capstan motor (the lagging capstan is belt-coupled). The rubber pinch-rollers are of slightly different diameters to prevent buildup of resonant vibrations from a common rotational frequency. Three additional DC motors operate the reel drives, the mechanism that pulls the head assembly and pinch-rollers into position, and the damped cassette-well door. The tape heads have separate re cording and playback elements in a common housing, insuring accurate alignment while enabling optimum de sign for each function and instant com parison between the incoming and the recorded signals during recording. The head cores are made of a multilayer amorphous cobalt compound and have oxygen-free-copper windings. The cassette well contains sensors that automatically set the equalization and bias for Type I (ferric), Type II (chrome or chrome-equivalent), or Type IV (metal) cassettes. Backlighting helps the user estimate how much tape remains on a side, though it does not enable reading the label on the cassette. The front of the cassette well is easily removable for routine head demagnetizing and cleaning. Signal levels are displayed on a pair of sixteen-segment, fluorescent peak- reading indicators, calibrated from —40 to +10 dB. Their 0-dB mark corresponds to the IEC-standard level of 250 nano-webers per meter and is thus suitable for current cassette tapes. (The older, 160-nWb/m Japanese standard required “running into the red” somewhat to minimize audible residual tape noise.) Momentary peaks above —7 dB remain lit for a second or so, and when the signal exceeds 0 dB an additional numeric indicator is provided that holds the maximum level until a reset button is pressed. 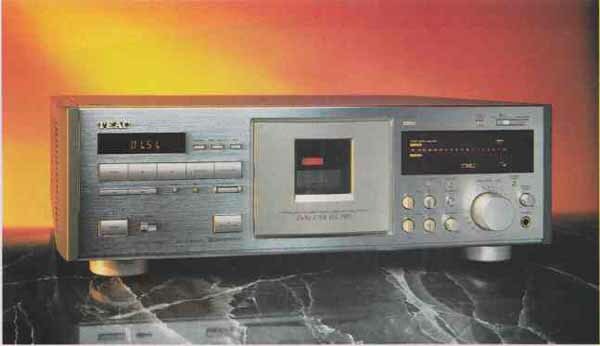 The display also shows the status of the Dolby system, the tape type in use, and whether the deck is set to source or tape. The main display panel also pro vides the calibrated zero markings for the user-adjustable bias and tape-sensitivity trimmers. Turning on record mode and pressing the Cal Start button activates an internal 358-Hz oscillator used to set the left- and right-channel sensitivity controls. This adjustment is important because the Dolby noise- reduction systems can introduce frequency-response errors if input and output levels don’t match fairly precisely at the Dolby calibration level. Pressing the Cal Start button once again switches the oscillator to 12.3 kHz, which is used to set the recording bias for the left and right channels. The bias level determines both the high- frequency performance of a tape and its distortion and overload characteristics. As with sensitivity, the optimum bias setting varies with the brand and formulation of cassette in use. Although the center-detent positions of the bias and sensitivity knobs will provide satisfactory performance with most tapes, it makes sense with a deck of this caliber to go for the best possible performance. Fortunately, the en tire calibration procedure takes less than 30 seconds, during which audio output from the deck is automatically muted. A small display on the left side of the front panel shows the elapsed tape time (there’s a pushbutton to select the tape length, necessary to insure accuracy). The same panel shows whether the deck is in record, play, or pause mode and is used to set the Computomatic Program Search (CPS) system to find a desired selection on the currently loaded tape. A large, calibrated-attenuator-style control sets the overall recording level, and a small balance knob is used to compensate for any left-right level discrepancies. Depending on the mode in use, the V-8000S automatically switches between source and tape set tings, and an Auto-Monitor override button enables instant A/B comparison of the source and taped signals. Motor-assisted pushbuttons control the transport mode, and a return-to- zero (RTZ) button fast-winds the tape to the initial counter position. The Dolby selector switch has four positions: off, B, C, and S.
The FM multiplex filter is switch- selectable and should be used only when dubbing stereo FM broadcasts, as it chops off all frequencies above 15.6 kHz. (When needed, this filter prevents 19-kHz stereo pilot-tone leakage from causing Dolby mistracking.) The front-panel headphone jack has its own level control; the main, rear-panel output level is not adjustable. In addition to the regular rear- panel input jacks, a switch-selectable CD-direct input is provided, together with dub-synchronizing features for use with Teac CD players. An additional switch selects the deck’s mode (record or playback) when it is operated from an external timer. Measured with our BASF IEC-standard calibrated tapes, the V-8000S’s playback response was very fiat. The slight rise in the very-low-frequency region (around 40 Hz) reflects the “fringing effect” of playing a full- track recording with stereo playback heads. Thus, the playback response is even flatter than it appears in the curves. For our overall record-playback tests we used our usual center-line samples of TDK AD (ferric), TDK SA (chrome-equivalent), and TDK MA (metal). In the bass, response from all three tapes was down by less than 2.5 dB all the way to 20Hz. With the metal formulation, overall response at the customary — 20-dB level was within ±1 dB from 24 Hz to 20 kHz. The response was equally flat at a 0-dB recording level when we used Dolby C noise reduction, whose somewhat lessened high-frequency pre-emphasis helps prevent tape saturation at the treble end. The overall response with TDK AD and SA, while not as superbly flat, was also good, being down by just a little over 2 dB at 18.5 kHz and 17 kHz, respectively. The wow-and-flutter figures we obtained from the V-8000S were among the lowest we have ever measured, and tape-speed error was practically nonexistent. Clearly, Teac’s engineers have succeeded spectacularly in achieving their goal of steady, accurate tape motion. Signal-to-noise-ratio (S/N) performance was no less impressive, measuring 78.1, 77.3, and 80.7 dB, respectively, for the three tapes (with Dolby C). High-speed winding in either direction was very fast, and input and out put levels were entirely normal. Dolby noise-reduction tracking error was within +1, -0.5 dB for Dolby B and +3, -2dB for Dolby C and S.
The Teac V-8000S was in every respect all we could desire in a cassette deck. Silent and solid in operation, its controls are well laid-out and easy to use. Save for the omission of a main playback-level control (almost never found on cassette decks these days), it lacks no convenience or performance feature that we would want to have. Sonically, it was superb. Good heads, good electronics, and a transport with negligible wow-and-flutter all contribute to a deck that can challenge the most critical ear to distinguish between original and copy when the levels are carefully matched. Frequency response and imaging were impeccable, and Dolby S proved able to remove the last traces of the low- frequency “grunge” that usually ac companies the dubbing process. In short, then, we found the Teac V 8000S to be one of the few decks we can recommend without reservation to the most serious listener.